Two weeks ago, I mentioned that members of the House of Oldenburg belonged to haplogroup R1b, based on Tsar Nicholas II's DNA. Here is a summary of all European kings and queens (and crown princes) whose haplogroup can be deduced from the testing of a relative. => See Kings of Denmark from Christian I to Frederick VI. All kings of France supposedly belonged to haplogroup R1b-Z381 (Y-DNA). All dukes of the House of Bourbon-Parma descended from Philip V of Spain, himself a grandson of Louis XIV of France, and therefore presumably belonging to Y-haplogroup R1b-Z381. All the kings of the Two Sicilies presumably belonged to Y-haplogroup R1b-Z381 as members of the House of Bourbon. According to the descendant testing listed at the Russian Nobility DNA Project at FTDNA, the branch of the Rurik dynasty descended from Vladimir II Monomakh (Monomakhoviches) belong to Y-DNA haplogroup N1c1, while the branch descended from his presumed paternal cousin Oleg I of Chernigov (Olgoviches) belonged to R1a1a. The Y-DNA from the Proto-Rurikid branches is N1c1 and matches the distinctive haplotype of the Monomakhoviches. Furthermore, this N1c1 haplotype possess the distinctive value DYS390=23, found in Scandinavia but not in Uralic populations, confirming that this was indeed the original haplotype of the Varangian prince Rurik (c. 830-c. 879) who established the Kievan Rus'. According to the descendant testing listed at the Russian Nobility DNA Project at FTDNA, the House of Gediminas (1285–1440), also known as Gediminids, belonged to Y-DNA haplogroup N1c1. Last edited by Maciamo; 29-01-14 at 18:06. DNA tested from the king's remains at Roskilde Cathedral. His earliest recorded matrilineal ancestor was Dubrawka of Bohemia (died 977). * heteroplasmy for 16169Y (common within haplogroup T). All the members of haplogroup T2 above descend from Adelheid von Alpeck (died 1280), daughter of Witegow von Alpeck. Their most recent common matrilineal ancestor is Elisabeth of Bohemia (1409–1442), daughter of Sigismund of Luxembourg, Holy Roman Emperor, and Barbara of Celje. Both of them descend in matrilineal line from Queen Victoria. This lineage's oldest known matrilineal ancestor would be Mathilde, mother of Cecile de Provence-Arles (died in 1150). The most recent common ancestor of the people on this page is Anne of Bohemia and Hungary (1503-1546). The subclade of H cannot be identified without results from the coding region. The 16111 mutation suggest that it might be H2. Various matrilineal descendants of Maria Theresa were tested and confirmed to belong to the same haplogroup. This lineage's oldest known matrilineal ancestor is Anna Katherina von Salm-Kyrburg (1614-1647). The most recent common ancestor to all the above-mentioned is Princess Christine Louise of Oettingen-Oettingen, who was the maternal grandmother of Maria Theresa of Austria, Queen Elisabeth Christine of Prussia, Queen Juliane Marie of Denmark and Tsar Peter II of Russia. This lineage is possibly H3 (mentioned as such above to differentiate it from the H lineage descending from Anne of Bohemia). It's interesting to see that 3 out of the 4 lineages descend from a Queen/Duchess of Bohemia. Last edited by Maciamo; 29-01-14 at 18:03. According to the Stuart/Stewart Project at FTDNA, King Charles II of Great Britain would have been R1b-L21. This is concordant with the history of the House of Stuart, who traces its roots to Brittany (a region with a high frequency of R-L21) before settling in Scotland during the Norman period. Very interesting, but if you isolate the Ydna, all these families are related to each other, mainly through Victoria, as she placed her many daughters quite wisely throughout Europe. "whose haplogroup can be deduced from the testing of a relative". I think that you should be a bit careful with this way of proceeding because Y chromosomes can easy be given by other men than "supposed to be fathers" especially if they just figure on old papers. I think that such an Y-DNA test would be very interesting in the case of the son of Catherine the Great of Russia. Because if the Y-chromosome of her son is not the same as the Y chromosome of her husband Tsar "Peter III", but of her good friend Sergei Saltykov, this would show that "legitimacy" is a far more "idealistic" value, also in dynasties than a reality based on real direct biological lineage. Last edited by Nicolas Peucelle; 16-12-09 at 03:06. I agree that paternity can easily be "compromised". However, Nicholas II Romanov's relatedness to Prince Philip, Duke of Edinburgh, was proven by comparing both Y-DNA. It means that the lineages that separate them ar at least uncompromised. Yes, no doubts for the family lineage after Paul I. But the main question may remain a bit unsolved.. Is the Tsar Paul I a "Romanov" or is he not. I guess that later on, over the generations, thanks to all kinds of cousin marriages the biological Romanov blood line was re-entering anyhow into the official Tsar family "through the back door". It is a bit "sad" to imagine that a man like Peter The Great may have no descendants at all today? Except for illegitimate unknown children. (I admit I didn't check precisely into the details of the other official daughters he had.. but his personal Y-Chromosome lineage for sure was ending because of all his sons deaths before they had sons.). Could you please point me to where it is possible to read about their comparison? I can't remember exactly where I saw something about this, but I believe that recently I saw an article that verified Pavel Petrovich as the son of Peter III and not the product of an affair with Sergei Saltykov. I believe the evidence was DNA based but I cannot find the article now. Thank you so much for posting the haplogroups of the European Kings and Queens. Very informative. I also study history as a hobby. (Iberian ancestry). Males cousins from both lines tested for our family. What, no Robert de Bruce? I'm reminded of the joke from one of Sir Terry Prattchet's Discworld novels, "The royal family had died out because they had inbred so much the last king kept trying to breed with himself..."
The Y-DNA and full mtDNA sequence of Napoleon Bonaparte are being tested. The results for the HVR1 section of mtDNA have already been disclosed. Only one rare mutation (16184C) was found to differ from the CRS. It's not enough to determine the haplogroup with certainty, but it is probably a subclade of hg H.
I believe there is an error in your first post in this thread. There must have been a mixup here. The haplogroup of Sweyn Estridson is not H5a but just H. The grave previously thought to belong to his mother Estrid cannot be Estrid, since the woman in that grave was of haplogroup H5a. Since Sweyn must have the same mtDNA haplogroup as his mother that woman in the grave cannot be his mother! The identity of Sweyn's grave is considered to be well established. The haplogroup of the persons cited should thus be changed from H5a to H.
They are all related mainly through the Danish royal family, even the Greek royal family was originally Danish. But Victoria did help a bit, Tsar Nicholas II, his wife Alexandra, Wilhelm II of Germany and George V of Great Britain were all first cousins. Sorry, you are right. I copied the mistake from Wikipedia ! Wikipedia is not reliable at all when it comes to population-genetics. Okey, I see! I corrected the Wikipedia article. What is the primary source of your information about the Stewart kings? Maciamo wrote: "haplogroup can be deduced from the testing of a relative"
Where can I see the test results and name of the male relative of a king of Scotland or England whose Y-DNA was tested in order to deduce the haplogroup of the House of Stewart, Maciamo? The web page at http://www.familytreedna.com/public/Stuart/default.aspx states that according to ftDNA's Deep Clade tests of several dukes, the House of Stewart belongs to Y-haplogroup R1b1a2a1a1b4 (R-L 21) (previously named R1b1b2a1b5). None of these Dukes' test results are shown. It is unlikely that a biological father of prince Albert was Ernest of Saxe-Coburg-Gotha. Ernest was noted for his antipathy to women, and it was rumored at the time that his treasurer, a Jew, had relieved the Duke of the distressing duty of engendering an heir. There was no suggestion of alternate parentage, for it was only after the birth of her two sons, at an interval of fourteen months, that Duchess Louise felt that she had discharged her duty, and no longer had to content herself with an ersatz husband, whom many gallant gentlemen gladly replaced. If the above is true, Prince William is likely to have R1a haplotype (in case Duke Ernest's treasurer was an Ashkenazi Jew) or, alternatively, one of "semitic" haplotypes of Y-DNA (in case the treasurer was a Sephardi Jew). It would be nice if it were true IMHO, but no such luck. 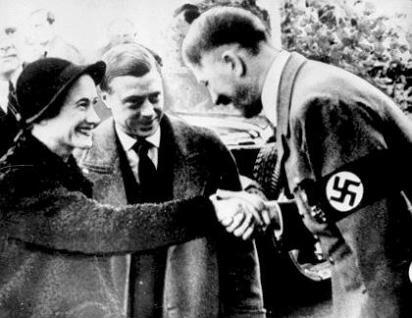 Maybe the point of that story was originally to embarrass the Duke of Windsor. Was Albert the only son of Ernst of Saxe-Coberg-Gotha? Anyway, Prince Philip Mountbatten who is William's grandfather tested, and he matches the House of Oldenberg and Czar Nicholas, as above. ... her great-great grandmother Eliza Kewark was a dark-skinned native of Bombay who had lived, without benefit of matrimony, with her great-great-grandfather Theodore Forbes while he worked for the East India Company. Unsavory as the taint of illegitimacy was, even at that distance in time, it was nothing compared with the stigma of what was then known as "colored blood." Had it been generally known that Ruth and her children were part-Indian, they might never have made good marriages. Eliza's true race was therefore expunged from the family tree and she reemerged as an Armenian. This fiction was maintained even when Diana married the Prince of Wales. It would be interesting to test their mtDNA. If it turns out that they are part South Asian then it might result in some positive publicity nowadays for the British Monarchy. All kings of France supposedly belonged to haplogroup G2a3 (Y-DNA). All we know is that a few STRs from a bloody handkerchief and one two SNPs indicate that the blood on the handkerchief was from a man who was G2a3-something, possibly G2a3b1a-L140, although the haplotype is very unusual and doesn't match anyone we have now. Dried blood from 220 years ago on some random object is not the same as actually testing the living descendants of a family. I keep telling Willy and the rest that there are plenty of patrilineal Capetian descendants out there, including some "Miguelist" Bragança from Portugal. Many of the Kings of Europe over the centuries were Capetians. Almost all the Americas was ruled by three Capetian monarchs from 1714-1760. There are hundreds of Capetian descendants, and many are legitimate yet not in the line of succession. This is EU-pedia, but no one wants to test them? I suggest we start with a Miguelist Bragança, and a Bourbon, who share a hypothetical common ancestor in Robert II King of France b. 975 and test them for Y-111 and a full SNP test. That will not only give us some answers about the unknown origins of Robert the Strong Count of Paris, but if they in fact match it would give us a very rough idea of what two divergent haplotypes look like at 111 STRs after 1000 years. Much attention has been attracted by the account of Richer of Reims, writing in the 990's, who is the only early author to give a supposed name for the father of Robert. Richer states that Robert was of the knightly class and that Robert's father (literally, the paternal grandfather of king Eudes) was a German named Witichinus ["Hic patrem habuit ex equestri ordine Rotbertum; avum vero paternum, Witichinum advenam Germanem." Richer, i, 5, MGH SS 3: 570]. The name Widukind (Witichinus) is a name of Saxon origin, borne not only by the above historian, but also the name of the principal leader of the Saxons who fought against Charlemagne. Thus, in apparent support of Richer, we have the account of Aimoin of Fleury, writing just after 1000, who states that Robert was of Saxon origin ["... Rotbertus Andegavensis comes, Saxonici generis vir, ..." Aimoin, Miracula S. Benedicti, i, 1, MGH SS 9: 374]. Against a Saxon origin for Robert we have not only the early evidence mentioned above, but the specific evidence of Widukind, the historian of the Saxons, who was writing a generation before Richer and Aimoin, and who, as noted above, indicates nothing of a Saxon origin for Robert's dynasty. As was pointed out by Lot, it is also possible here that Aimoin's "Saxon" did not refer to ethnic origin, but just indicated that the geographical origin of the family was from Germany, ruled by a Saxon dynasty at the time that Aimoin was writing [Lot (1902), 432, n. 1; Werner (1997), 12]. If this family is in fact G2a3*, then they are likely to be what Ray calls "G2a3b1a6 - DYS643=9". What early evidence that exists for the place of origin of Robert le Fort has him coming from East Francia, or more specifically the region around Mainz, Worms, and Speier, and places him in a family of noble but not royal blood. Meingaud, count of Wormsgau and Mayenfeld, who died in 892, appears in Regino of Prüm's annals as a nepos of king Eudes, son of Robert le Fort. A Robert, son of count Robert, donated two manses in Mettenheim in Wormsgau with appurtenances to the monastery of Lorsch in 836×7. This Robert's father was evidently count in Wormsgau. In 876, a count Meingaud of Wormsgau (probably not the same man who died in 892, but at the very least a relative) and his nepos Eudes (Voto) donated one manse in Mettenheim with appurtenances to Lorsch. This common connection to Mettenhem suggests that Meingaud was closely related to the Robert of 836×7. Since the appearance of a Meingaud, relative of king Eudes son of Robert le Fort on one hand, compared to Robert, apparent relative of a Meingaud and his nepos Eudes on the other hand, is unlikely to be a coincidence, and since Robert son of Robert appears in precisely the area where we would expect to find Robert le Fort, the evidence points strongly to the conclusion that they were the same man. Maybe one Capetian descendant reading this page will volunteer to be tested? Until someone tests some Capetians, it seems to me that this page in Eupedia has pretty much nothing to say about the DNA of the Kings and Queens of Europe. I could have guessed "R1b", "H" and "T2" in my sleep.